Took a break from building and painting models to work on a table idea for Shadow War or smaller games of 40k (maybe even Zone Mortalis if you just play the table without terrain). I figure, if you want a ton of levels to play at why not start with a level built into the board itself? Going for a long dried out sewage treatment plant or something of that ilk. If nothing else, sludgy water channels all over a city. Once I get this all done I can set out working on the pieces of terrain that take it vertical; the plan is to have at least four levels above the main table level (six levels for models!). 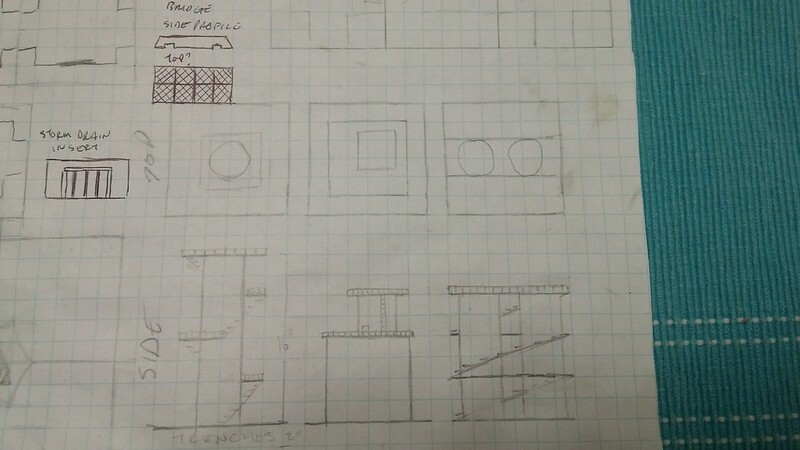 This is my rough sketching of the tiles themselves as well as some of the details I plan to do ("F" tiles are entirely raised up 2" to allow for larger buildings). 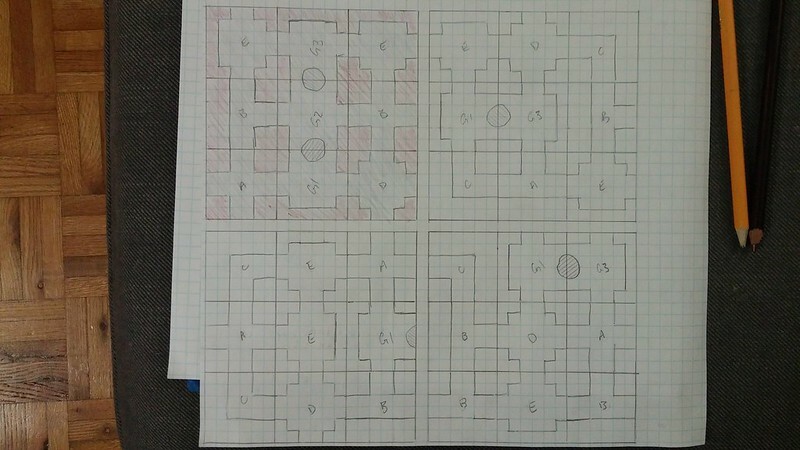 I got on a sketching roll and did a few 3x3 tables thinking more about Zone Mortalis, one has been shaded to indicate playable area (grey). More to follow, any questions or comments are more than welcome! As much as I've drawn until it's all glued in place there's room for anything to happen. Khorne's Fist and Aalidakh like this. Last edited by ntaw; 05-27-17 at 12:28 AM. Some ideas for buildings, the large one is much more a general idea of size than the others. For the core structures of the thin tower and the double-stack I'm planning on using empty cans (classic) and foamcore panels like the main flooring for the walkways. 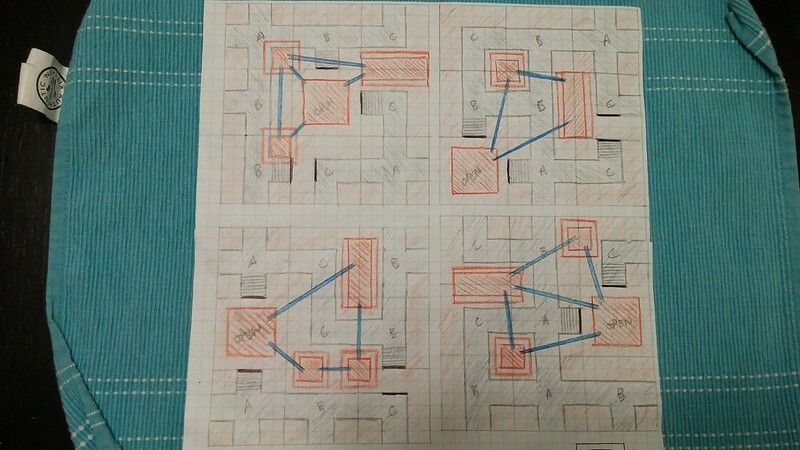 These are my original rough drawings of 3x3 table combinations. Red squares are buildings and blue lines are walkways between them at varying heights. The walkways will be similar to the bridges, I'd like to be able to make them up to 16" long but we'll see what supports models when I start doing sub assembly (essentially, eons from now when the board and buildings are done). 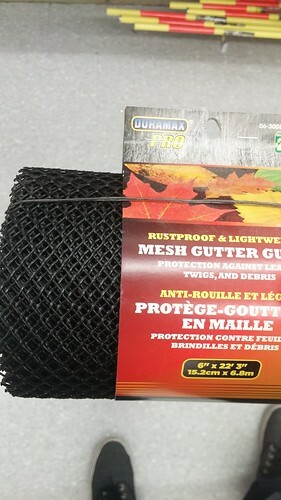 I originally thought I would be doing the cutting myself, but some young and helpful lad at Rona set me up pretty huge. 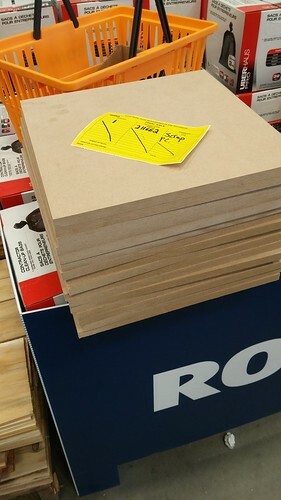 I got this stack of 1/2" MDF cut into 1' squares for a whopping $3.39 after hunting for some scrap. Special shout-out goes to the person that cut a 4" strip off the long side of a 8'x4' sheet. That's a win! 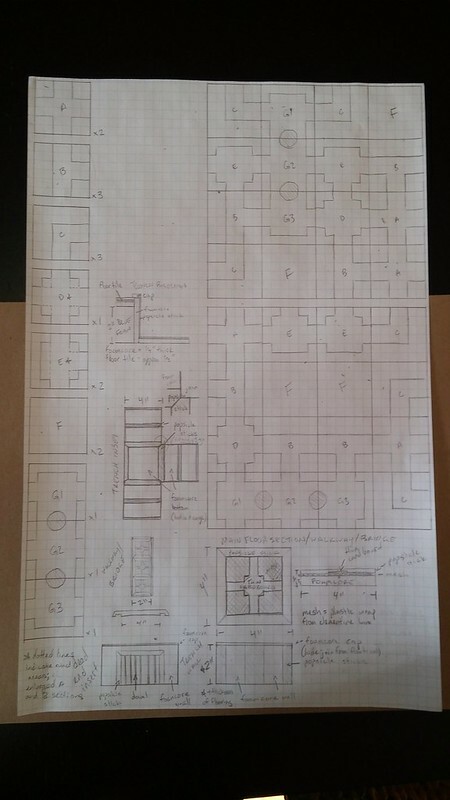 I've already measured and penciled out some of the tiles. 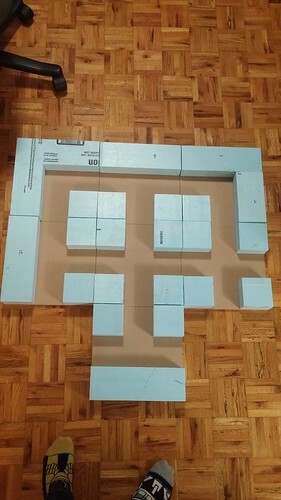 Going to try and find time to cut all my foam into the requisite bits needed for this project this week. Woo! Old Man78 and Aalidakh like this. I will be following this keenly! ntaw and Aalidakh like this. 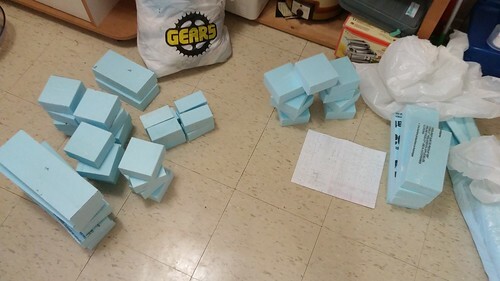 On scrounging my storage locker I got a couple 2'x2' squares of 2" foam available for this. We'll see if that's enough when I start cutting things up I think I may have to grab a bit more, but I may have just found a buyer for one of my older tables (4x4 trench table) so that will pretty much seal the deal on supplies (and space...oh, space) for this project and maybe even get some fresh plastic! 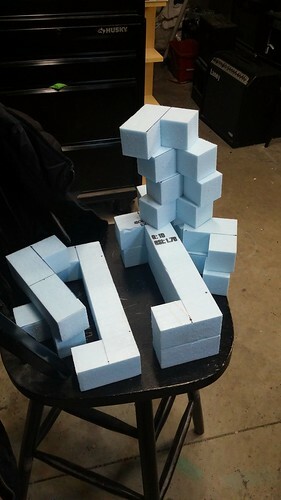 Well, I didn't have enough 2" foam to get everything cut today, but I got a crap ton accomplished regardless. I have all of the 4" and most of the 2" cuts done, but not the 12" squares. I'll do my best to get some gluing done and pics up by the end of the week. Cutting foam with a band saw is the best ever, by the way. Doing these blocks with a knife or wire cutter would have been waaaaay more work. The stack on the left is good to go, stuff on the right needs to go back for some more cutting. 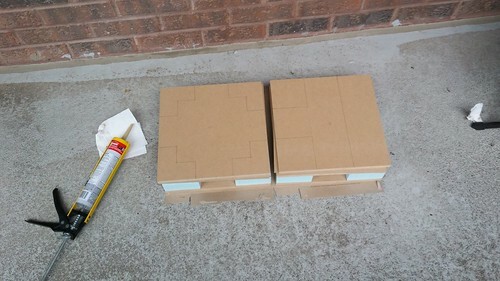 I got the requisite foam for the fully raised up tiles as well so back to the workshop I go if I get some spare time. Looks like a pretty epic project! 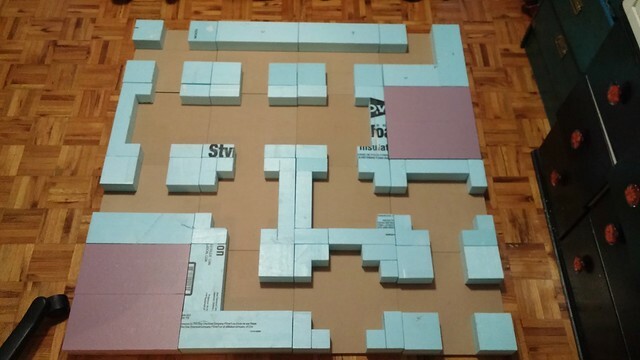 Got the 'room' tiles cut yesterday, figured I'd start with clean edges despite wanting to fill in the corners for a battle-damaged/eroded look. Sadly it won't be warm enough to glue outside until Sunday. Stupid weather!